Just saw this post on the NESEA site go up yesterday. Looks like they are now accepting entries for the 2015 award. 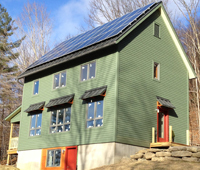 If you have built or live in a home that has produced more energy than it uses in the last year, then I encourage you to enter the competition. They have worked to make the application process a bit easier this year and the benefits of winning include not only the prize money, but also a chance to meet some of the leading proponents and practitioners of building net zero structures at the yearly conference when they announce the winner. You also get your building’s picture on the cover of BuildingEnergy magazine. I highly recommend you apply, it is well worth the effort. Do it quickly, the deadline is December 15.